Massage Oils do not have to be expensive, but you need to buy the right kind of oils and make sure they are high quality. Using quality massage oil is important for the therapists as well as clients point of view. There are many different types of massage oils available in the market. Some oils are more likely to leave you feeling greasy after the massage, while other massage oils go rancid quickly and take on an unpleasant smell. Worse, some oils might irritate skin or cause allergic reactions. It is unfortunate that most massage therapists have never experienced a true, therapeutic grade of massage oil. Most massage oils do not get absorbed into the skin quickly, it does not have to be reapplied frequently throughout the session. Our Gecko Holly Massage Oil is made from natural ingredients to create each of our unique formulations. Holly Massage Oil provides the most gentle, yet powerful tools to help you promote physical healing and reduce stress. You apply it super-sparingly; just cover your finger tips. You won’t see a slick sheen on the skin, but the skin will be workable for the entire massage treatment. Holly Massage Oil gives you just enough grips to do bone deep trigger point and with only the tiniest bit more applied. 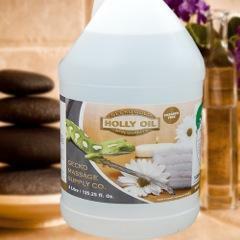 Holly Massage Oil is hypo-allergenic and breaks down in warm water. It is non-staining and have no scents or scent neutralizers in them. We use the strictest ingredient guidelines to ensure safe, environmentally friendly products. Inviting all massage therapists, massage colleges, massage schools, body workers and all who want to offer the best possible treatment to each and every client consistently turn to Geckomassage.com because we are a massage therapist owned company, every product you see on our website has a purpose and a track record for effectiveness. Rely on Gecko Massage Supply Co for quality massage oil at competitive prices for an unparalleled one-stop shopping experience so you can concentrate on your massage business.